There is no doubt, being a nurse is demanding – physically and emotionally. While there are a lot of great moments in nursing, sometimes even when everything goes "right" with a patient, the outcome is not the one a team was expecting. In those moments it can be hard to keep going, but nurses are strong and know they must. This is called resiliency. Resilience is about building on the strength nurses have naturally, to develop new strategies to handle setbacks and challenges. Resilient nurses are the ones who accept those letdowns and then adapt and thrive in spite of those difficult situations. It is the same for nurses going back to school to earn their RN to BSN. The tips below can help nurses – or anyone – navigate the challenges of work, school and the rest of life. A healthy body supports a healthy mind. Endorphins are a natural painkiller so whether it's taking a spin class, going for a walk on a lunch break, or taking the stairs instead of the elevator, exercise can reduce stress. Endorphins are also known to improve sleep, which can lower stress as well. Several studies have shown a healthy circle of support can contribute positively to resiliency and well-being. A sense of belonging, increased self-worth, and feelings of security are just some of the benefits of a network of support. A support network can include friends, family, co-workers or other peers and give nurses people to vent to, sympathize with, problem-solve with or to just have some care-free fun. Caregivers like nurses are highly susceptible to a chronic stress called compassion fatigue. Signs of compassion fatigue include emotional exhaustion, reduced sense of personal accomplishment or meaning in work, mental exhaustion, isolation, depersonalization, and physical exhaustion. Recognizing these signs is the first step in managing compassion fatigue. Nurses can also make sure they set boundaries for themselves, express their needs (to friends, family members and managers alike), be kind to themselves and accept that not everything is in their control. Self-efficacy is best described as an individual knowing she has what it takes to do a certain job. When faced with a challenge nurses can rely on their past successes to know they can face a new challenge. The problem is that not everyone knows everything all the time. Mentors and goal-setting can help prepare nurses for new challenges. Goal setting helps nurses anticipate future situations and build up the skills they will need to handle them. 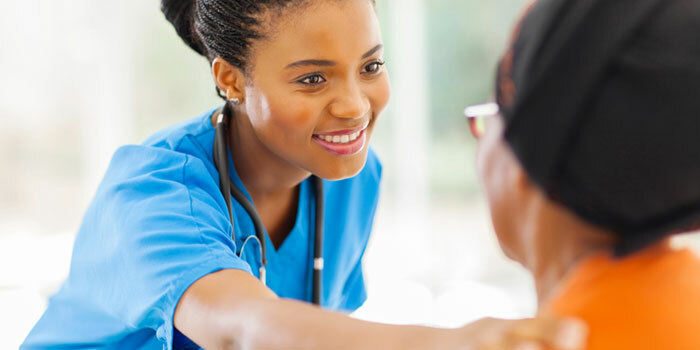 Having a mentor who has experience gives nurses a trustworthy guide to turn to for advice. The grittiness of nursing life can sometimes make sayings like "the power of positive thinking" seem trite. But, studies have shown there is a link between positivity and resilience. Positivity can be more than seeing the silver lining in something. Sometimes acts of kindness in spite of a stressful situation can have lasting impact. Trying things like thanking someone supportive, recognizing a co-worker's great work or randomly paying for a stranger's coffee can brighten a nurse's day – as well as the people around them! Mindfulness is about focusing on what is happening in the moment. The keys to mindfulness is accepting thoughts and feelings without judgement and being fully present in the moment (instead of doing some multi-tasking thinking about everything else in life). Mindfulness does take practice though. Starting meditation or yoga can help nurses start to hone their mindfulness. The key is start off with small chunks of time, and then increase practice steadily over time.